Hampton University’s brass band, marching band, and Ebony Fire Dance Team welcomed the museum members with music and dance New Orleans jazz style, complete with the dance team donning white and carrying white umbrellas. The Museum offered refreshments and snacks while conference attendees could peruse the collections inside the Museum. After a while, the visitors, dressed all in white, walked to the University Café to continue the celebration with food, drinks, music and dancing. “I feel like the red carpet has been rolled out, the food is wonderful, the school band was out here and it’s just our way to wrap up the conference and a chance for everybody to show their gratitude, the Host Committee, the Board, everyone who comes together for this wonderful networking and professional development opportunity,” said Brian Carter, Board President of the Association of African American Museums. The week-long conference and culminating White Party gave participants chances to collaborate, learn about other museums, talk with each other, and make life-long friends. 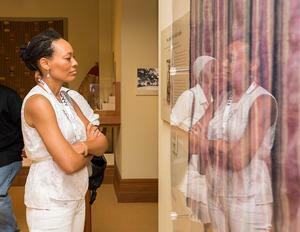 “Because of the richness of the history of which we have, it was important for us to connect with those who had gone through the same struggles as us starting an African American museum, as well as connecting those who are going through the struggle of telling their story,” said Rosalind Withers, Executive Director and Founder of the Withers Collection Museum and Gallery in Memphis, Tennessee. The White Party was a true success, as well as the 40th Conference of the Association of African American Museums. “Thank you to Hampton University, specifically to the Museum here on campus and Dr. Thaxton-Ward for all that she did, and the Host Committee did to welcome us and have a really professional, organized and still friendly and really lovely conference for us, so thank you to the University and congratulations on their anniversary,” said Carter.